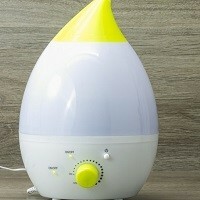 Home » FAQs » Which Humidifiers are the Quietest? The noise you hear from a humidifier is the fan that operates inside the unit to disperse moisture into your indoor air. Not all humidifiers have a fan, and there are some that are quiet even when a fan is used. There are two primary categories of humidifiers – whole-house humidifiers and portable room humidifiers. Using a metal diaphragm, the ultrasonic humidifier emits an ultrasonic frequency through vibrations. The vibrations create water droplets that are transferred to the air using a fan. They are generally the quietest because the frequency is higher than we can hear. These humidifiers are generally the loudest of all the portable humidifiers. They use internal fans to generate airflow, but the noise sounds more like white noise. Some people can handle the sound because it fades into background noise. They produce a warm, soothing mist that adds moisture to your indoor air. The mist can be seen and felt and are popular for treating the flu and colds. Warm mist humidifiers don’t use a fan, which allows them to operate almost silently. They are quieter than cool mist humidifiers, which use a fan. All whole-home humidifiers should run silently and not create any noise noticeable in your home. They are installed inside your heating and cooling system, so any noise they might make is masked by the noise from your HVAC system. You can install three different types of whole-house humidifiers in your home. The bypass humidifier doesn’t have a fan but instead uses the blower inside your furnace to disperse moisture into your indoor air. A fan-powered humidifier has its own internal fan that disperses humidity to your air stream even when the furnace isn’t running. Steam humidifiers offer the best of both worlds. 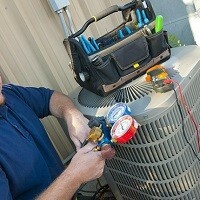 They have an internal fan to supply steam directly to your air whether the furnace is operating or not. However, it is silent so the fan isn’t heard and the steam offers a pure and natural alternative to other moisture supplies.